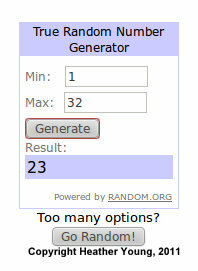 And in case you are wondering, to choose I went through your comments, assigning a number to each of your entries, then used random.org to choose the winner, which was #23, Tina’s first entry. Congratulations to Tina! Heather, thanks for hosting. Hope you enjoy your little treasures! What another, special blessing from God to your family. 🙂 A little reminder that He’s got your back! On that note, I’ve really enjoyed hearing how God has been providing for you.